There has to be at least one meeting during the transfer review process but as explained by Ipsea, this doesn’t have to be at the beginning. A first draft of the Plan has to be provided with sufficient time for the family to respond before the final deadline. 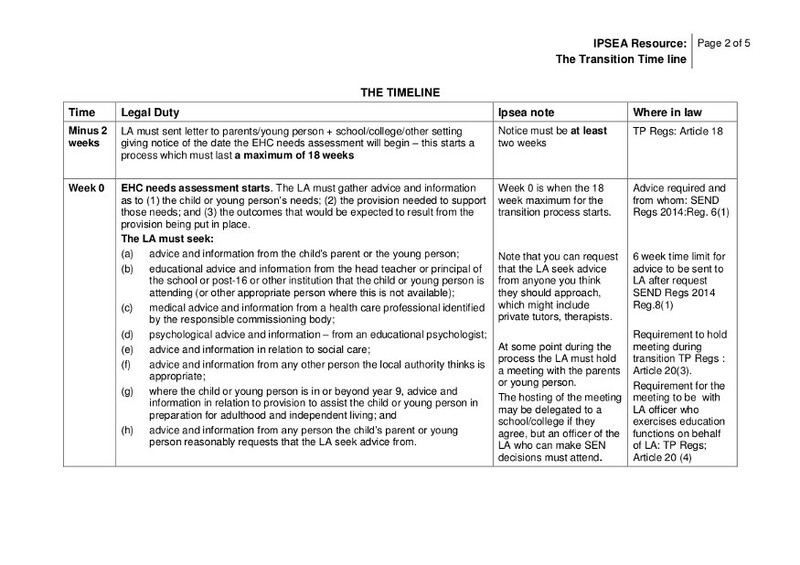 Ipsea Transition Timetable says by week 12 while the Council for Disabled Children Timescales of Transfer Reviews says by week 14. NB Because the legislation sets out a timescale of 18 weeks plus 2 weeks notice, some commentators logically refer to “minus 2 weeks” followed by week 1 to 18. Hence “week 12” or “week 14” refer to 6 weeks/4 weeks before the final deadline. 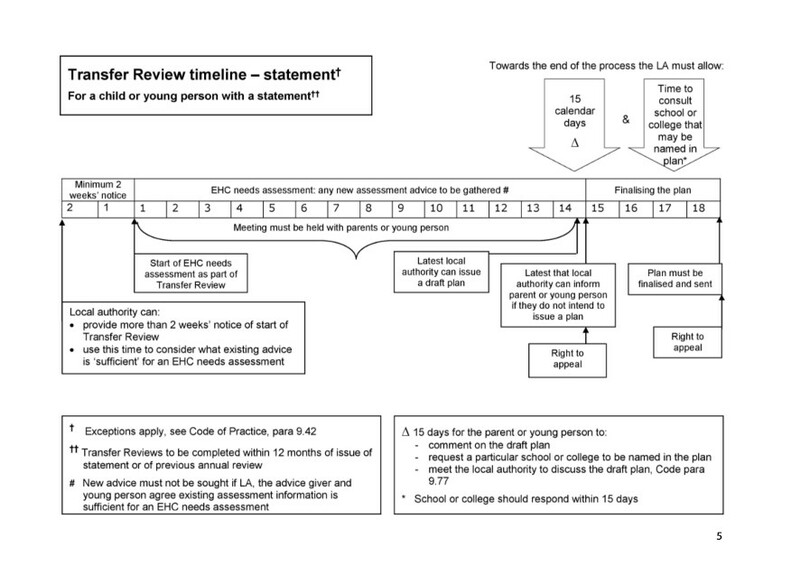 From my research into the letters sent families about EHCP transfers, many local authorities are opting to start the process of converting a statement to a plan by giving parents 2 weeks notice of “the transfer review meeting”. This may be out of convenience – because it follows the normal statement review procedure – or because the authority believes this is what the law dictates. This may be the only meeting the authority normally expects to have. 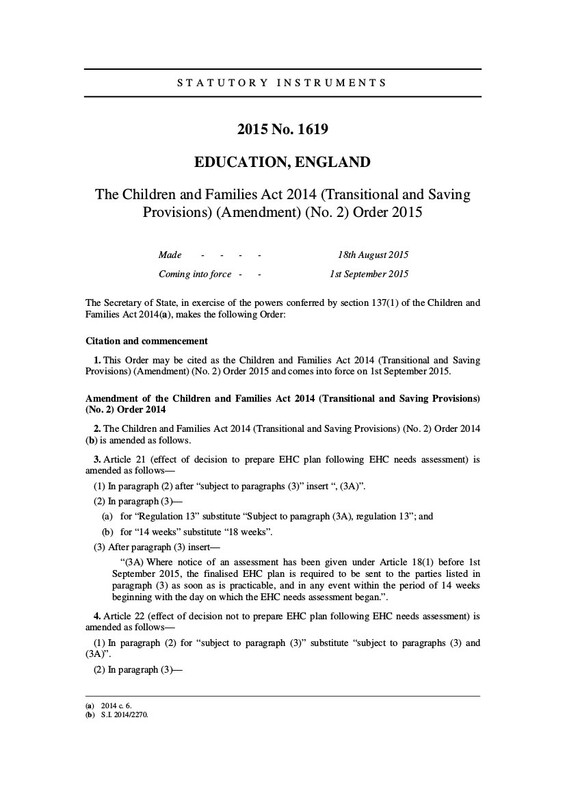 Information derived from “the transfer review meeting” is used either to decide that the statement will be ceased with no need for a Plan, or alternatively it may form the basis of the EHC Plan. Another scenario is where the authority will already have taken information from the statement to pre-populate an EHC Plan template and “the transfer review meeting” will be more of a conversation about “outcomes” and asking for quotes to fill out certain parts of the Plan. This is described as making the process more person-centred. 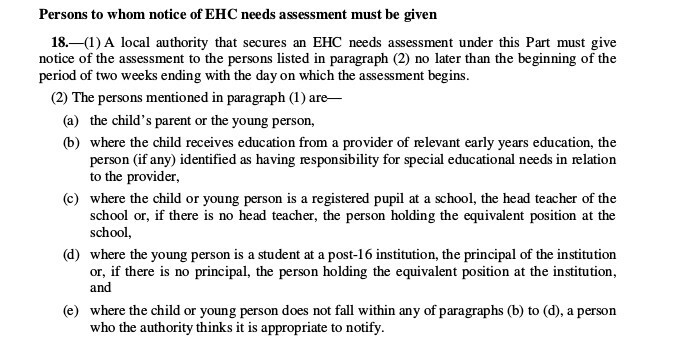 Parents may be asked directly if they think any new assessments are required, and sometimes the council might imply that the Government doesn’t want them to do new assessments – or that they aren’t allowed to do any new assessments – unless the parent specifically requests it. Where new reports ARE requested, the Government says these must be supplied within 6 weeks, and this is something that local authorities do invariably mention. 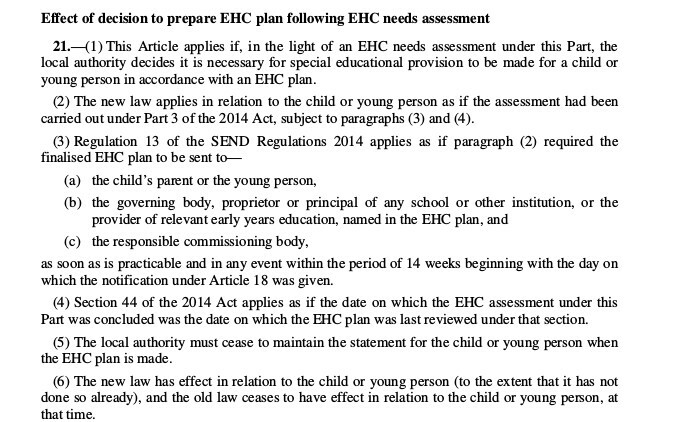 From my research so far it seems that some local authorities don’t necessarily expect to provide a first draft of the EHC Plan, and families might not see anything before the final draft. 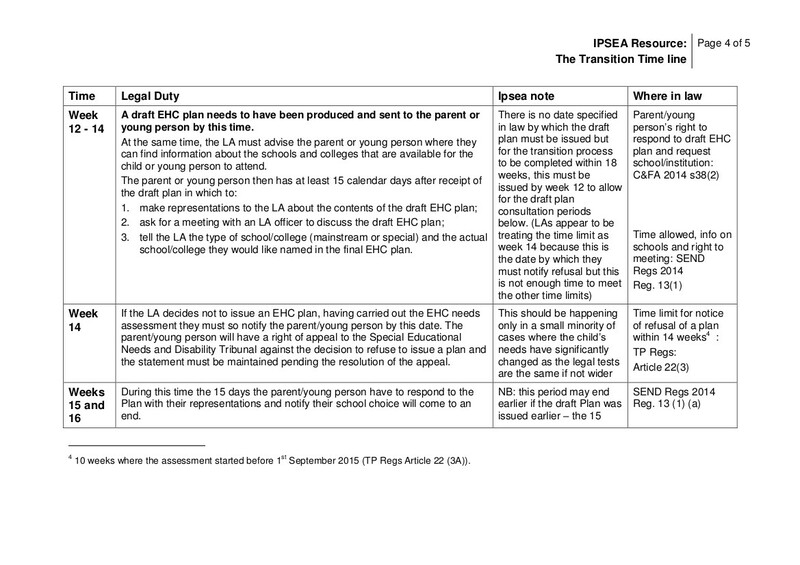 (1)Where a local authority is required to secure that an EHC plan is prepared for a child or young person, it must consult the child’s parent or the young person about the content of the plan during the preparation of a draft of the plan. (ii)request the authority to secure that a particular school or other institution within subsection (3) is named in the plan. (b)advise them where they can find information about the schools and colleges that are available for the child or young person to attend.